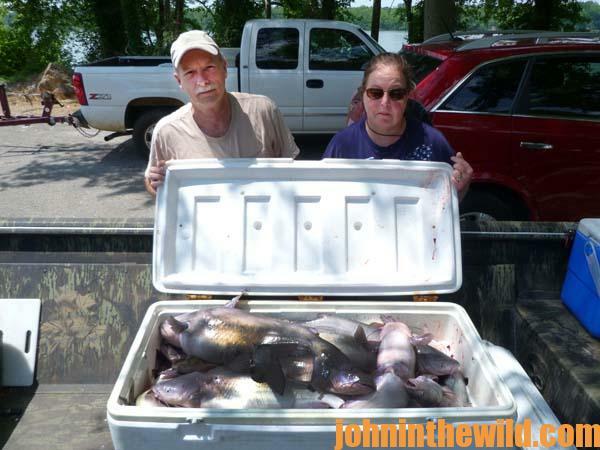 John’s Note: Forty-nine-year old Brian Barton of Muscle Shoals, Alabama, has been catfishing for 35 years and guiding anglers for 3-1/2-years on the Tennessee River, one of the premier catfishing waterways in the nation. It’s very fertile, it has mussel beds, it has an abundance of shad, and it has hydroelectric power plants all along the river. 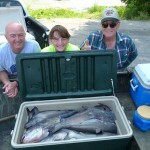 Every spring and summer catfishermen from around the nation come to the Tennessee River to catch blue, channel and flathead catfish, expecting to catch 100 pounds of cats per day. 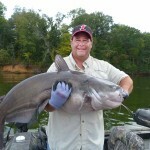 I’ve asked Barton to tell us five different ways he catches cats on the Tennessee River that you can use where you catfish. 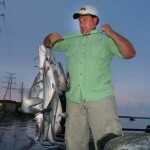 This week we’ve also included videos of Phil King of Corinth, Mississippi – one of the world’s fastest catfish cleaners. I also like to fish jigs and spoons for catfish. I use two Mr. Twister striper jigs tied onto my main line about 18 inches apart. My main line is 80-pound-test braid. I’ll attach about 36 inches of 40-pound-test monofilament line to the braid with a barrel swivel, tie my top jig about 18 inches from the barrel swivel and on the end of the monofilament line and tie on my bottom striper jig. I like a high vis main line. Often when the catfish takes the jig, the catfish is swimming forward. Instead of feeling the bite, the line will go slack, and I know to set the hook. You can place a rod on the front of the boat in a rod holder and push these jigs, or you can turn your boat sideways, put the motor in the middle of the boat and pull these jigs. I pull the boat at about .3 mph to .5 mph, and keep the bottom jig about 2-feet off the bottom. The real key to the success of this technique is to tip each jig with a live minnow or a strip of cut bait. My favorite bait is to tip each jig with a crappie-size shiner minnow. I’ve tried several different colors of jigs, and I’ve found that the jig with the red head and white hair seems to produce the best. I think this technique produces the best, because we can cover a lot of water and catch a lot of cats. I think the catfish, especially in deep water, can see that red head and the white-haired body easily in deep water. By hooking a crappie minnow on the end of the hook, the jig gives off scent for the catfish to follow to the bait. 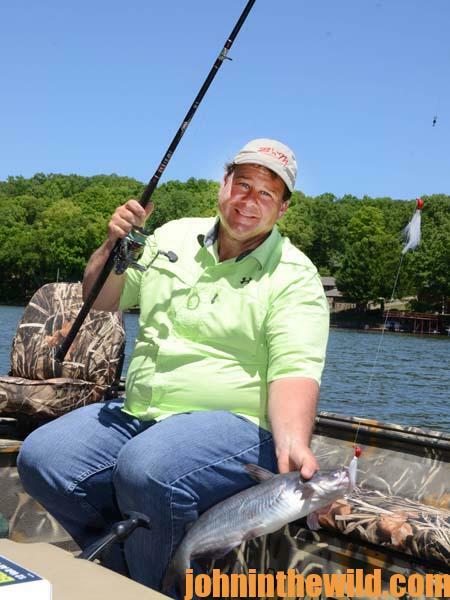 When I’m using this trolling tactic, I use a lighter-action rod like the B‘n’M 8-foot Silver Cat rod which is much lighter than the B‘n’M Magnum rod. Using this trolling method, the average cat we’ll catch will be 1-1/2 – to 3 pounds – a good eating-size cat. On a good day, we’ll usually catch 25 to 40 cats using this technique. The best areas on the Tennessee River for using this tactic are on sheer rock bluffs, on the main river or trolling the edge of the main river channel. 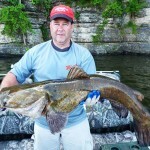 This technique usually works best in the late winter, the early spring or anytime the catfish start moving up on the ledges in 25 to 30 feet of water or on the pea gravel points on the main lake. Most of the time, I find the catfish with my electronics. I use baitcasting reels that have line counters on them to count the jigs down to the depth of water that I see the catfish holding. If you don’t have a line counter reel, you can measure a foot and make a mark on your rod. I pull out 5 foot of line, and I use a magic marker to mark every 5 feet on my line. With three rods and three rod holders, we’ll often troll an angler on the front of the boat and other clients on the back of the boat. Using this set-up, we’ll have 12 jigs trolling all the time, and we’ve caught as many as five catfish at one time. You may troll for 20 to 30 minutes and not get a bite. 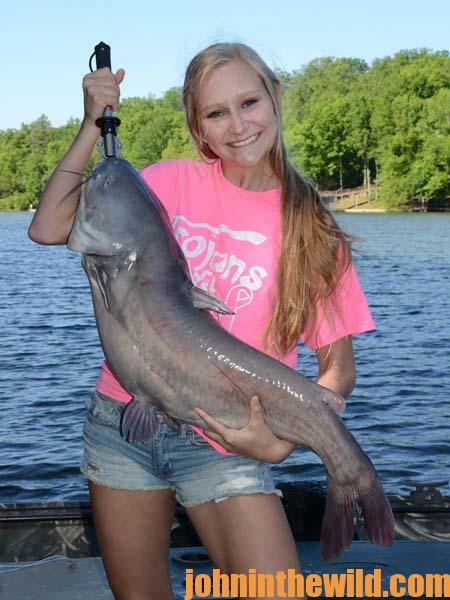 But when you do get a bite, you may be trolling through a school of catfish. Often, we’ll turn around and troll back through that same school of catfish. After you catch one fish out of the school, the catfish seem to get fired-up and eager to bite. To contact Brian Barton you can reach him at brianbartonoutdoors@aol.com; you can go to his website at www.brianbartonoutdoors.com. Or, you can visit him on Facebook. 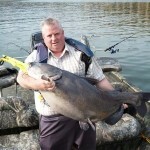 On his Facebook page, you can look at more photos of the type and number of fish he’s been catching.